Vintage and modern trains side by side in the London Underground on Aug. 2, 2014. Photo by Tom Doel / Flickr.com. We would do well to think about the future of transportation, and rail in particular, in the same way. Progress is generally an evolutionary, rather than a revolutionary, process. Much energy and money is being directed towards revolutionary concepts like maglev and hyperloop. Even true high-speed rail like Europe, China and Japan have is rather revolutionary by American standards given the current state of US passenger rail. 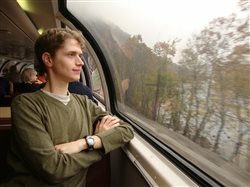 Instead, proponents of passenger train development in North America would get more results for the same money and effort if it were invested in evolutionary improvements that built upon the existing system — allowing it to carry greater volumes of passengers more reliably, affordably and conveniently by adding frequencies and new or extended routes. Existing types of passenger equipment, even some that are more than a half century old like mid-20th-century streamliners, can also be adapted and modernized to meet the needs of the present and near future. I’d say most passengers don’t care how old the car they’re riding in is as long as it’s clean, safe and comfortable and gets them where they’re going on schedule. Interestingly, there isn’t as much talk of revolutionary developments on the scale of a hyperloop on the freight side of the industry. More focus is on adapting to evolving technologies, particularly Positive Train Control, more fuel-efficient locomotives, and ways of collecting and analyzing greater volumes of data. Freight railroads and their suppliers seem fairly content with the success of existing technologies, with containerization, intermodal and double-stacking being the most recent major innovations. Of course, environmental pressures and the long-term upward trajectory in the cost of energy will continue to drive greater fuel efficiency and perhaps even the electrification of more of the most trafficked main lines, as is the standard in Europe and elsewhere. In fact, some of the most broadly popular initiatives of freight railroads are those that preserve, interpret and re-create history — particularly the mainline steam programs of Norfolk Southern and Union Pacific and of a few short lines like the Reading and Northern. And the ongoing popularity of preservation tourist railroads and rail museums demonstrates that the public is far from an “out with the old and in with the new” mentality. It’s hard not to be wooed by images of sleek, futuristic trains, and that which is novel will always hold appeal when that which is familiar is of subpar quality (stale, worn out, often late, prone to mechanical failures, etc.). But building an entirely new infrastructure will very rarely be more cost-effective than upgrading the existing one, and can only be justified in a few core markets (like Los Angeles-San Francisco and Dallas-Houston) where it can displace a substantial amount of air traffic. A slightly faster, much more frequent, and more reliable corridor is enough to attract riders away from cars (which carry the vast majority of intercity and regional traffic), and this ridership base may grow to the point of justifying new infrastructure farther down the line. There is one revolutionary change that needs to be happen to really set the evolution of passenger rail (and, to a certain extent, freight rail) in motion: a correction of the gross imbalance in federal and state policy in favor of roads and highways. As long as railroads are left to compete as private enterprises while their chief competition is treated as a public utility, with governments continuing to pour millions into building and expanding highways, railroads will remain stuck in a rut. Government leaders need to start viewing railroads as worthy of a similar level of investment to highways and as more of a public resource, albeit one that is privately owned. Though railroads may resist the strings that often come attached to public funds, a policy revolution away from undue road centrism would bring much more benefit than drawback to both the freight and passenger sides of the industry. We don’t need to reinvent the flanged steel wheel. We just need to remove the chocks of misdirected policy that keep that wheel from rolling at track speed into the future.